VATICAN CITY (CNS) — Pope Francis, who has called for zero tolerance for the “despicable” crime of sexual abuse of minors, has praised new efforts aimed at helping the church better protect children. Boston Cardinal Sean P. O’Malley read the letter aloud at a news conference Feb. 16 inaugurating the official launch of the center and its activities. The launch followed a three-year pilot project phase. The center, which offers an onsite and online prevention and child protection program and diploma, was established in 2012 as a way to help build awareness and train religious and lay leaders globally about the problem of abuse. 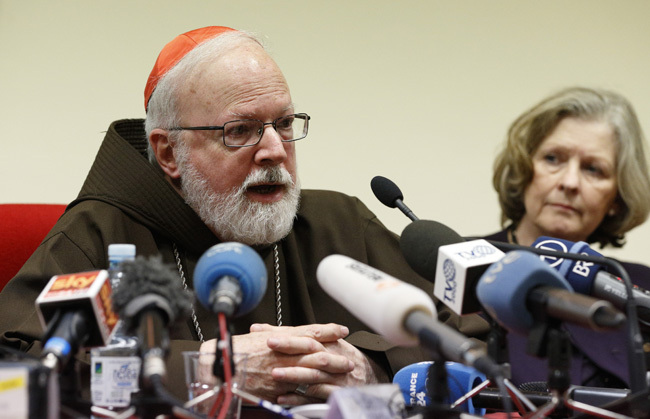 Cardinal O’Malley, 70, who heads the Pontifical Commission for Child Protection, said he remembers “being raised without much awareness” about abuse and only later saw how the “climate of secrecy and shame” caused so much damage. While the pontifical commission will be focusing on helping the church develop better policies and procedures for protecting minors, it will also put extra emphasis on real accountability for bishops who do not comply with child protection norms adopted by their bishops’ conferences and approved by the Vatican. The Center for Child Protection, on the other hand, will focus on training, education and raising awareness as well as promoting more research on the scope of abuse in the church and its causes. While many abuse survivors emphasize the need to hold church leaders accountable, many underestimate the continued need for education, said U.S. Msgr. Stephen Rossetti, a licensed psychologist who has many years’ experience teaching pastoral studies and leading the St. Luke Institute, a treatment center in Maryland for priests and religious with addictions and psychological problems. “Education is really the key, it really makes the difference. It sounds trite, but it’s true,” he told Catholic News Service. “It changes the whole system,” he said. The church now is “more hostile to an abuser,” making it a place where an abuser will not be tolerated, he said. Think of the church as a bank, he said, “and which bank are you going to rob…? The less vigilant one. So you work to make the bank stronger” and more resilient against those whose motives are to harm. In the field of child protection in the United States, he said, after a decade of work “we are seeing the results” with the number of abuse cases reported dropping and 5 million Americans having gone through some form of the church’s child protection training. “Education has become the most important part” in abuse protection, he said, even though much media attention right now is on leadership accountability.